We’re big in Japan…. well kind of. One of our favorite Hero Bags customers, Masayo Yumoto and her daughter Sakura recently went home to Tokyo and came back to San Francisco with a story worth sharing. Strangers in a restaurant trend spot Masayo’s Hero Bags and offer to buy them from her! Masayo shares her story with us in her own words. Thank you Masayo for brokering our first International Hero Bags sale! 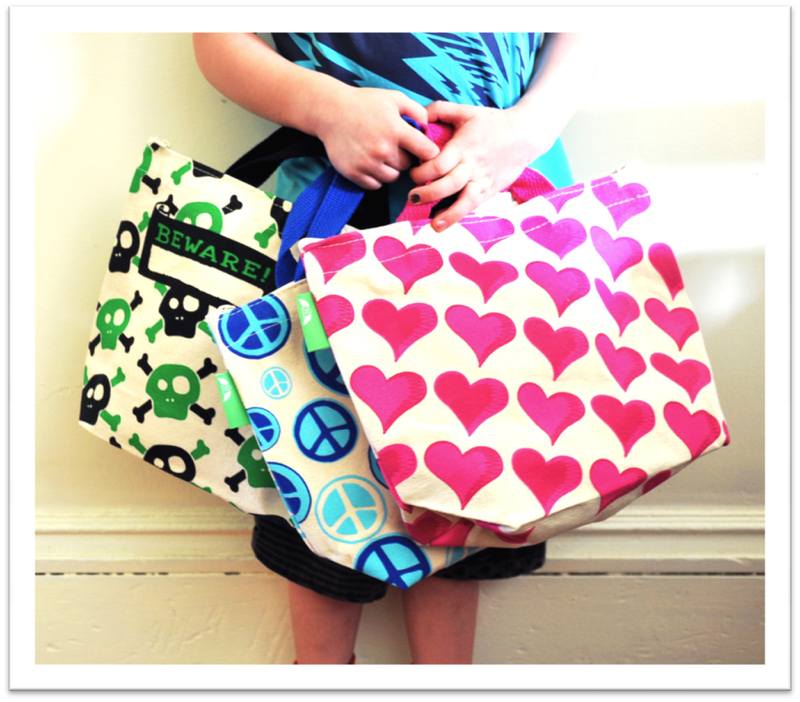 Introducing the Peace, Love & Pirates lunch bag collection from Hero Bags. This trio of lunch bags is the cutest, hippest set of lunch bags on the streets today. How did we do it you ask? Here at Hero Bags HQ in San Francisco, we start with our superior zipper-top lunch bag design made from certified organic cotton from Texas silk screened with high quality inks, free of phthalates, PVC and heavy metals. Then we set out on a quest for the fun stuff, awesome design themes and killer graphics. To find out what’s hip and happening with kids today; we hung out with the cool kids at playgrounds, lunchrooms, soccer fields, and pizza parties – we checked out Fuzzy Fuzzy Cute Cute on YouTube and played a little Wii Super Mario – we broke down the Kidz Bop success formula and dissected Justin Bieber’s hairstyle and dance moves. Finally, we refueled with big bowls of mac & cheese and drew inspiration from the all-time mega-hit – Star Wars: Episode IV! What did we learn? That, shockingly, pink hearts are crazy popular with girls (resistance is futile), that Peace signs are back baby (and gender neutral! ), that pirate skulls are hot (and cool) right now and that kids are insane, fun, romantic, imaginative and unpredictable and – oh yeah and that Star Wars: Episode IV – A New Hope is the best movie made EVER. We’re so excited! Our new picnic tote is here and just in time for Spring / Summer! Grab a bottle of wine, some gourmet goodies and someone special to share it all with and head off for a day of sunshine with your brand new picnic tote over your shoulder. Our new picnic tote is a four panel bag with two interior pockets designed to hold a bottle of wine, cutlery with plenty of room to hold gourmet to-go containers. The decorative exterior of the tote is silk screened with a bright yellow trompe l’oeil wicker pattern with bright blue bottles and cutlery tucked into a wicker faux pocket. The print design references traditional picnic baskets and is an exclusive design of Hero Bags. Our picnic tote retails for $34.95 and may be purchased on our website as well as select gourmet stores and wineries in California. Attention all pork lovers! Finally a lunch bag worthy of carrying your porcine goodies to work. 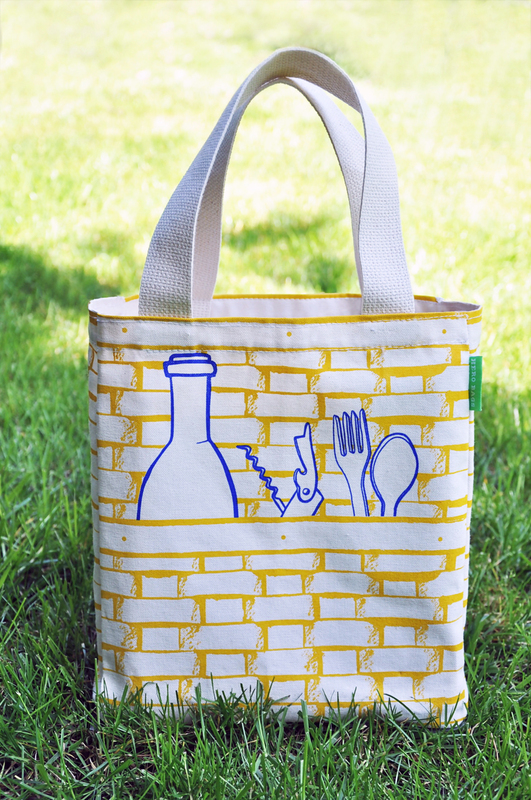 Pay homage to the delicious pig with our first lunch bag designed for the serious food lover. Made to fit your largest homemade BLT sandwich, snacks and a tall beverage. Hero Bags’ original pig butchery artwork and ‘Lunch’ silk screened on the front. Simple shape inspired by origami and a cotton napkin. Made in the USA in a fair labor factory out of organic cotton grown in Texas. Back-To-School SALE on all Lunch Bags! Pick up a new lunch bag for the kids, and maybe one for yourself. Hero Bags entire line of super cute organic cotton, zipper top, machine washable lunch bags are currently 15% off right now. Freebie Friday. Win A ‘One Bottle Bag’ Wine Tote! That’s right folks. Freebie Friday = Free Stuff here at Hero Bags. We’ve just released our newest addition to the Hero Bags line, The ‘One Bottle Bag’ and we are so excited that we are giving one of our fabulous new wine totes away (FREE) on our blog to ONE lucky winner. Our Hero Bags ‘One Bottle Bag’ canvas wine tote is pretty nifty thing, it’s the it’s perfect tote to bring along wine to a friends house, picnic, BYOB restaurant or to give as a hostess gift. The clever illustration of a wine bottle on the front means that it also looks great on the shelf just storing that next bottle of wine you’re going to gift. How to win? Just make a comment below on this blog posting as to which beverage of choice you would tote in your brand new Hero Bags ‘One Bottle Bag’. Get creative, have fun because everyone is reading and the winner is picked at random. The contest runs one week so spread the word. BONUS to Freebie Friday is Sale Saturday! If you don’t win and want to purchase a bag – we’ve got a deal for you, Sale Saturday! Immediately following the end of Freebie Friday is Sale Saturday (July 4th) where our ‘One Bottle Bag’ will go on sale (the percentage of discount is yet to be announced) for 48 hours on our website so you can snap up one (or two) of our Hero Bags “One Bottle Bags’ at a discount – Score a great bag for a great deal. Sale Saturday Starts 7/4. 1. The rules are simple, between Friday 6/26 – Friday 7/3 (5PM pacific standard time) enter your comment on our Hero Bags blog. We reserve the right to remove any spam or inappropriate comments. 2. One winner per giveaway unless otherwise noted. We draw a random number using the website http://random.org/ and use that number to correspond with the comment number on the giveaway page. 3. Entrants must have a U.S. mailing address and be 21 or older to enter. 5. We will contact the winner and ask for a mailing address. If winner does not respond within one week of being contacted, we will redraw and reassign a new winner. 6. Privacy. We do not collect any of your personal data off of this blog. Your emails are not stored, sold or solicited unless you win and then you get an email from us asking for your address to send you free stuff. Our annual Hero Bags Earth Day Sales event is underway! Visit our website for 25% off all bags & totes. Use coupon code ‘earthday’ at checkout. Sale ends May 17th. Hero Bags now on Facebook! wine gift bags linked to criminal activity?! The perfect holiday gift for the wine lover!